Obfusc's debut album is an instant classic, offering 5 original tracks and 4 remixes. The official video for "Before We Lose Our Legs" - originally featured on the limited edition DVD available with this release. "To "obfuscate" means to hide or conceal. By coining the new word "obfusc", Joseph X. Burke of New York has created a noun which perhaps delineates the very stuff of which concealment is made. It sounds terribly sticky and viscous, either way. Which is odd, because I find the music on his new CD Internal Countryside to be light, bright, and anything but deceptive or concealing. In fact, it is downright pleasant, a breath of rather fresh air in a world where solo electronic artists tend more toward melancholy than cheer. Perhaps Burke is a tad bipolar; his tracks too mostly sport dismal names, like "Friends Fade In Fade Out", "Before We Lose Our Legs" and "Goodbye Forever", quite in contrast to their musical contents. If I am reading the small print on the promo right, four of the nine tracks are remixes of Obfusc's music by artists called Mint and Cheju and the like. This surprises me, since I detected no break with the overall, and pleasing, consistency of the album. Throughout, uncomplicate rhythms accompany lilting melodies, sprinkled with snippets of found sound." "This release from 2006 features 47 minutes of contemporary electronic music with an illbient edge. Obfusc is Joseph X. Burke. A liquid flow drives this sultry music. The electronics vary from dreamy tones to hyperactive sparkles penetrating the pulsating fog. Textures ooze like pensive mists, while glimmering effects litter the cloudy overhang. Chords roll out with crystalline clarity, winding their way through thickets of fuzzy percussives. The e-perc possesses a snappy edge that bestows a cheeriness on the songs. The rhythms often manifest as glitchy beats that would be agitating if not for the smooth nature displayed by the rest of the sounds. The overall disposition of this music is peppy, a pleasant dose of urban ambience, lively but not pursuing the dancefloor medium. Melody plays a vital role, which is uncommon in most illbient electronic compositions. Burke strives to balance the gritty, often low voltage demeanor of the genre with a lavish sheen is ultimately very satisfying." "The brainchild of Brooklyn's Joseph X. Burke, Obfusc sounds distinctly worldly in its outlook. 'Friends Fade In Fade Out' sees elegant synth melodies aligned to chill-out beats. 'Jade Tree Ghost Town' is Oriental-flavoured and features sampled voices whilst the fun and fruity 'Grand Chasms Trace The Sky' captures Burke in playful mode. Interestingly, half of the tracks included on this record are actually remixes, which either speaks of a lack of material or indicates the adaptabilty of his own work. The latter argument would appear to be stronger as Mint's 'Spiral Mix' version of 'Orthodox Contortionist' is an excellent diversion into Boards Of Canada-style mystery and Cheju's take on 'Jade Tree Ghost Town' ensures that every note is drawn out with haunting results. The closing 'Goodbye Forever' is another melancholic highlight on another quietly impressive release from Boltfish. " "Despite the artist's name, there's nothing obfuscatory about this latest collection of fireside electronica from Boltfish. Created by Brooklyn, NY-based Joseph X. Burke, Obfusc's Internal Countryside is mood music tailor-made to soothe the too-stressed soul. The opener "Friends Fade In Fade Out," a particularly lovely example of warm electronic music, gets a nicely funky boost when crisp breaks join the tune's delicate interplay of acoustic and electronic sounds. Understatedly suggesting the Far East , "Jade Tree Ghost Town" chimes sweetly while "Grand Chasms Trace The Sky" swings with a rather old-school analog vibe. Field elements and found sounds add atmosphere to four originals before Burke passes the baton to Boltfish associates Mint, Cheju, and others for a quartet of remixes: Mint's ‘Spiral' treatment cloaks "Orthodox Contortionist" in a cloudburst of silken funk, and Ova Looven deftly merges glimmering ambiance with softly driving pulses in a "Friends Fade In Fade Out" makeover..."
"Joseph Burke has been quietly putting out low-key releases for a while now and getting into it with some remixes. It's great to see him having a whole CD devoted to his chilled out, friendly and unpretentious sound on the excellent Boltfish label and he fully deserves the exposure. His sound is deep and melodic and takes its cues from classic Electronica whilst giving it his own identifiable sound as well and this piece of work flows so nicely that if you're a fan of purist sounds you'd be very foolish not to get in on the action. It includes remixes from Boltfish main men Cheju and Mint as well as a version from Ova Looven. Essentially this album is great and if you like good music (as opposed to what is currently trendy or being talked about) you'd be well advised to seek this out. Recommended." "Internal Countryside has 9 tracks (the final 4 tracks being remixes) of warm electronica that flows as smoothly as ocean water on a lazy summer day..."
"Boltfish is a new label for me, but taking a look at their website, it seems that they are quite a busy bunch. They work mainly with musicians of electronic music, and can perhaps, just judging based on this release by Obfusc, be seen as another branch dealing with the melancholic side of dance music. A label along side Expanding Records, Highpoint Lowlife and Ai Records, to mention three Vital Weekly regulars. Obfusc is Joseph X. Burke from Brooklyn, New York, who loves police scanner recordings, 1940's sci-fi radio, voicemail messages as found sound to his rhythm driven melodies. Sometimes he puts his arpeggio buttons on and the rhythm is more stomping than we would expect, but throughout there is a sense of melancholy in his music. However he sets himself a bit aside of the rest of the mob, in the sense that his music is a bit more rougher in it's edges, perhaps even a bit more analogue than some of his more software driven companions. That makes 'Internal Countryside' into a pleasant album that is trying to sound different in an overcrowded world and that is of course always a good thing. Nice collection that is never too long or never too short." 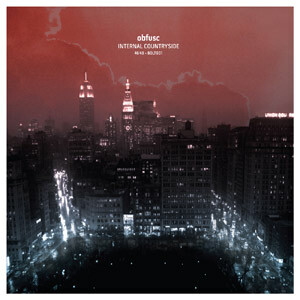 ""Internal Countryside" is another excellent EP on the ever so lovely Boltfish Recordings. Obfusc is Joseph X Burke hailing from NY City in the States (really not that many options on that one are there?). The reason for calling this release an EP allthough there are nine tracks on it in total is the fact that out of the nine tracks, four of them are remixes. Mint, Cheju, SBCF1 Milieu and Ova Looven all contribute with delightful remixes. In the five tracks Obfusc displays an acute sense for both melody and rhythms. A well-balanced mix of percussions set in live mode as well as programmed. The four remixes do Obfusc work justice and adds even more variaty to the EP, that the original five tracks were already very capable of creating on their own. This is yet another enjoyable encounter on Boltfish."